New! A plush sculpted Christmas monkey wearing a gorgeous lustrous velvet red Santa hat and holding a realistic banana. Available in six hat colors. L$75. Copyable and modifiable. 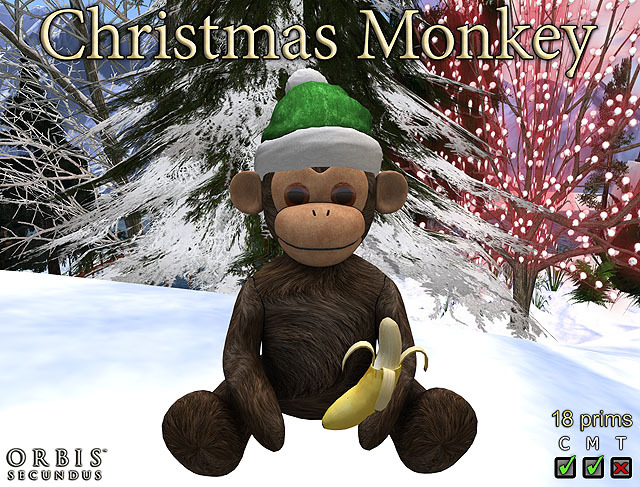 Click here to buy the Christmas Monkey With Red Santa Hat at the Second Life Marketplace. Click here to buy the Christmas Monkey With Green Santa Hat. Click here to buy the Christmas Monkey With Blue Santa Hat. Click here to buy the Christmas Monkey With Purple Santa Hat. Click here to buy the Christmas Monkey With Pink Santa Hat. Click here to buy the Christmas Monkey With Black Santa Hat.